They’re crunchy, greasy, salty, and just plain irresistible—if you’re looking for some of the most mouth-watering French fries in Rhode Island, there’s no need to search any further than one of these incredible restaurants. Friskie Fries serves what can only be called poutine on acid. You’re going to love the Cluck-U—fries dressed in crispy chicken, buffalo sauce and bleu cheese dressing—or the alley cat, which dresses their fries in fresh garlic, olive oil and parmesan cheese. There are even sweet fries, like the cinnamon sugar or S’moresome, so you can have fries for dinner and dessert! It would seem to make sense that some of the best French fries in Rhode Island are, well, French! Plouf Plouf is recognizable by the large chicken logo on its side—and its truffle fries are incredible, covered in the right sorts of salts and herbs on top. The garlic knot fries here are always kicking, and come to your table with plenty of great sauce smothered on top. It’s a great compliment to the fries’ greasy base. Served with aioli, these fries come out nice and stringy, meaning they’re extra packed with flavor. Doherty’s is known for it’s Buffalo fries, which pack a surprising spicy flavor that you wouldn’t expect to come from an Irish pub! Though this place can be packed on weekends, make sure to stick around long enough to grab fries with your drinks! The cheesy gouda sauce is a thing of dreams. Steak fries are the specialty at the Waterman Grille. 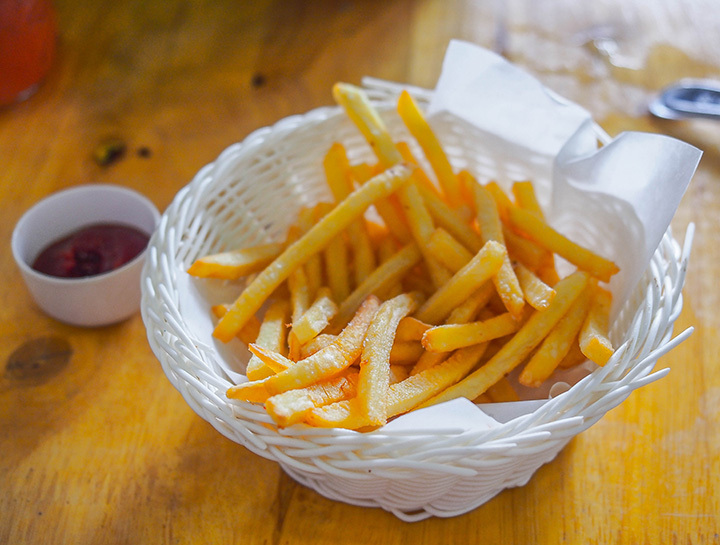 You’ll love extra skin on the wedge-cut fries, which are jam-packed with delicious seasoning. The Beef Barn slow cooks their meat for optimum flavor that packs a real punch. No matter what you’re getting, make sure to add on a side of large fries for just $1.75 more—they’re perfectly soft and steamy on the inside with a crispy outside that will leave you craving more. Looking for some classic fries that aren’t trying to go overboard? Go for the fries at this traditional American restaurant, which come perfectly fresh and crisp.